Newsletter February 2014 – Spelling and spellbinding! Spelling is less important than spellbinding! “spɛlbʌɪnd” verb / gerund or present participle: spellbinding. To hold the complete attention of (someone) as though by magic; to fascinate. Synonyms: fascinating, enthralling, entrancing, captivating, riveting, gripping, very interesting, very exciting, thrilling, absorbing, compelling, hypnotic and magical. Origins: dated back to the 1800’s from the words “spell” (magic) and “bind” (captivate). I hear many reasons why people are not so good at doing whatever they have to do in English (apart from just speaking it) and some of the excuses I like best are “because I want to be perfect!” or “because I am afraid of making mistakes”. I don’t want to get onto that “broom” with them so I ask them then, in that moment, to think about the speakers, presenters, trainers, leaders, do-ers…in fact anyone who held their attention for longer than 5 minutes and who left them feeling inspired and motivated. I ask them to describe the use of vocabulary, voices, body language, gestures and facial expressions. Then I ask them to tell me if everything the person did was “perfect”. Was the pronunciation always 100% correct? Of if they knew whether the person had actually spelt everything correctly? Well you know as well as I do what the answer is. When somebody is being absolutely spellbinding with their message, their voice, their gestures…(in other words their authenticity) pronunciation, grammatical correctness and spelling matters less. In that very moment they are creating spellbinding “magic”! Don’t get me wrong. I truly appreciate the strive for perfection and professionalism in what we do, but spending too much time on not making mistakes or trying to be perfect brings you exactly that, which you don’t want. In there lies another “magic” that “energy flows where your attention goes”. So turn it around. 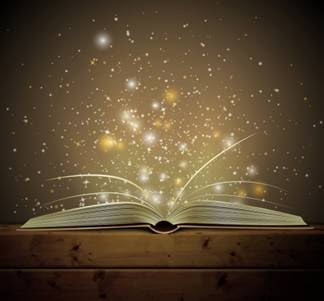 Break the spell, cast some positive magic, and be a spellbinding presenter or communicator. I wish you a fantastic February and I look forward to sharing some linguistic magic with you! PS 1: Thank you to Jerry Wechsler for his line which served as inspiration for this NL! PS 4: If you can’t be spellbinding – knowing how to spell is certainly a very big advantage – book your English course now!